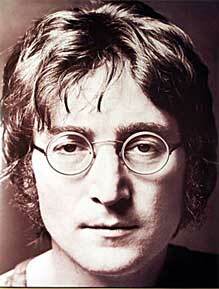 John Winston Lennon was born in Liverpool on 9th October 1940. When he was five his father returned from war and tried to take John from his mother, Julia, who declared that the marriage was over. John ended up being raised by his Aunt Mimi and Uncle George in a very strict household. John's mother died when he was 17, killed by a car outside his aunt's house in 1958. Although he didn't live with his mother, he worshipped her; she had encouraged his burgeoning interest in music and offered to buy him his first guitar. He was devastated by her death. Lennon didn't fare well at school and spent most of his time playing truant. He loved drawing and writing, however, and enrolled at Liverpool Art College. His first band, The Quarrymen, came together in 1955, and together they produced cover versions of popular radio songs. In 1957 Lennon was introduced to Paul McCartney, and the Beatles band was formed. John came up with the name, and they started off with gigs at the Cavern, a Liverpool nightclub famous for showcasing new bands. Music entrepreneur Brian Epstein, who became their manager, spotted them there. Their first single, Love Me Do was released in 1962. Lennon married Cynthia Powell in 1962, and their son Julian was born in 1963. John later left Cynthia for Japanese artist Yoko Ono, whom he met at an exhibition of her work in 1966. They had a son, Sean. In the late 1960s Lennon's partnership with McCartney began to suffer and, disillusioned with the Beatles, Lennon began to pursue his own interests. He and Yoko campaigned against the war in Vietnam, and staged idealistic events as a form of protest - their famous 'bed-in for peace' took place in Amsterdam in 1969. Their single Give Peace a Chance became the anthem of the peace movement. Lennon's solo album of 1970, with the Plastic Ono Band, produced lyrics that were his most personal yet, confronting the pain of his unhappy childhood and his mother's death. Imagine, in 1971, was the last album he made in the UK. Shortly afterwards he left for the USA, and his songwriting became a vehicle for political sloganeering, on issues ranging from the US prison system to radical feminism. In 1980, fanatic Mark Chapman shot Lennon dead in New York. Fans mourned across the world. It was Lennon who asked McCartney to join his band The Quarrymen in 1957. John and Yoko once auctioned their hair to raise money for peace. Elvis Presley warned Nixon against The Beatles, claiming they were 'a real force for anti-American spirit'. John first took LSD after a dentist secretly slipped it into his drink. Lennon actually signed an autograph for his assassin Mark Chapman outside his apartment - a few hours before Chapman shot him.